In a study published in “Food and Chemical Toxicology” researchers led by Gilles-Eric Seralini from CRIIGEN have found that rats fed on a diet containing NK603 Roundup tolerant genetically modified maize or given water containing Roundup, at levels permitted in drinking water and genetically modified crops in the US, developed cancers faster and died earlier than rats fed on a standard diet. They suffered breast cancer and severe liver and kidney damage. The researchers hypothesize that the reason why NK603, NK603 sprayed with Roundup, and Roundup on its own, all produced very similar negative health outcomes, is that both the genetically engineered maize and the herbicide Roundup have similar disruptive impacts on the endocrine systems of animals that ingest them. Endocrine glands are responsible for producing a range of hormones that regulate many key bodily functions, notably including cell reproduction. Pesticide exposure, not obesity alone, can contribute to increased cardiovascular disease risk and inflammation in premenopausal women, according to a new study published in the Endocrine Society’s Journal of Clinical Endocrinology & Metabolism. The study looked at the effects of exposure to polychlorinated pesticides such as DDT. Although DDT was banned in many countries in the 1970s, it remains widespread in the environment and food supply. DDT was one of the first recognized endocrine-disrupting chemicals, according to the introductory guide to endocrine-disrupting chemicals published by the Endocrine Society and IPEN. DDT and related pesticides are known as environmental estrogens because they can mimic and interfere with the function of the hormone estrogen. Research has found DDT exposure is linked to birth defects, reduced fertility and increased risk of Type 2 diabetes. The study analyzed the amount of endocrine-disrupting chemicals in fat tissue and blood samples from 121 obese women who underwent bariatric surgery at S. João Hospital in Porto. Among the participants, 73 were classified as premenopausal and 48 were postmenopausal. The researchers tested the participants’ fasting blood glucose and cholesterol. Using the Framingham risk score, the researchers assessed the women’s 10-year risk of developing cardiovascular disease. Researchers found that among premenopausal women, women with higher concentrations of environmental estrogens in their visceral fat tissue from the belly were more likely to have higher average blood sugar levels. Among premenopausal women, those with higher levels of environmental estrogens in their blood tended to have more inflammation and faced a greater risk of cardiovascular disease on the Framingham scale. The study, “Inflammatory and Cardiometabolic Risk on Obesity: Role of Environmental Xenoestrogens,”was published online at http://press.endocrine.org/doi/10.1210/jc.2014-4136, ahead of print. So, Is Organic Food Really Better? While health-conscious individuals understand the benefits of eating fresh fruits and veggies, they may not be aware of the amount of pesticides they could be ingesting along with their vitamin C and fiber. A recent study published in the Feb. 5 edition of Environmental Health Perspectives is among the first to predict a person’s pesticide exposure based on information about their usual diet. The study was led by Cynthia Curl, an assistant professor in Boise State University’s School of Allied Health Sciences. Curl and her colleagues analyzed the dietary exposure of nearly 4,500 people from six U.S. cities to organophosphates (OPs), the most common insecticides used on conventionally grown produce in the United States. 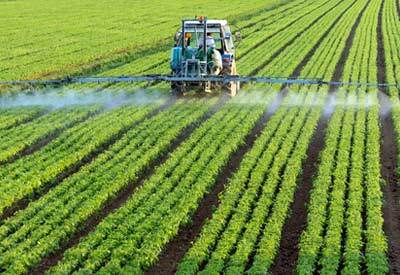 OP pesticides are linked to a number of detrimental health effects, particularly among agricultural workers who are regularly exposed to the chemicals. Results showed that among individuals eating similar amounts of fruits and vegetables, those who reported eating organic produce had significantly lower OP pesticide exposures than those consuming conventionally grown produce. In addition, consuming those conventionally grown foods typically treated with more of these pesticides during production, including apples, nectarines and peaches, was associated with significantly higher levels of exposure. This study included dietary data collected from participants in the Multi-Ethnic Study of Atherosclerosis, a large, multi-institutional project funded by the National Heart, Lung and Blood Institute that is investigating factors that influence the onset of cardiovascular disease. The researchers were able to predict each participant’s exposure to OP pesticides based on the amount and type of produce each participant typically ate and the U.S. Department of Agriculture’s measurements of pesticide residue levels on those foods. The researchers then compared these predictions to pesticide metabolite levels measured in urine samples from a subset of 720 of these people. While Curl’s study is not the first to link organic produce with reduced pesticide exposure, the method she used may have significant implications for future research. By combining self-reported information on typical food consumption with USDA measurements, researchers will be able to conduct research on the relationship between dietary pesticide exposure and health outcomes in bigger populations, without needing to measure urinary metabolites. 3. (Food and Chemical Toxicology, DOI: 10.1016/j.fct.2012.08.005).